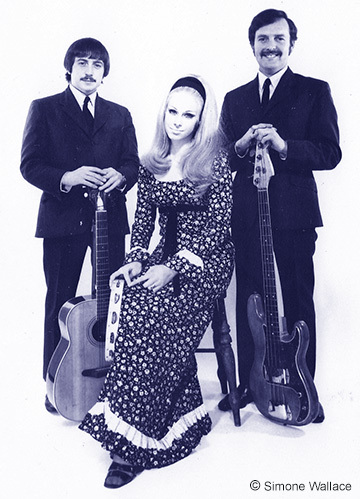 The folk music boom of the 1960s was well served in Birmingham by a variety of groups including this trio who performed under the name of "The Southeners". Their story is presented here as told with assistance from original group members. 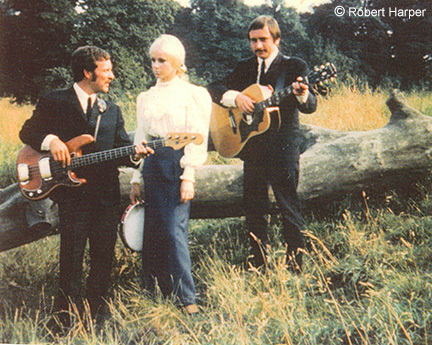 "The Southeners" folk trio were formed early in 1969. Their bass guitarist Terry Wallace was a founding member of Birmingham's legendary Vikings rock 'n' roll group that had dynamic vocalist Keith Powell in their line-up. While later fronted by Carl Wayne, the Vikings became the foundation for The Move. Lead vocalist for The Southeners was Terry's wife Cheryl who provided an attractive focal point for the group on-stage. "I have to say that it was the most enjoyable time I ever had in the music business"
Their guitarist Robbie Harper was also a veteran of the Birmingham 1960s music scene having played previously in The Brumbeats who had a recording contract with Decca. Robbie; "I was in the Brumbeats along with Bruce Gibbins, Tony Carter and Alan Buxton after Roger Hill and Graham Gallery left to go on the cruise liners. I really got into folk music, regularly attending the Jug O' Punch, The Metro and loads of other clubs." (Note: The Brumbeats should not be confused with the other "Brum Beats" that included keyboardist/vocalist Norman Haines - later of the reggae/progressive band Locomotive). Robbie Harper remembers; "Terry and myself got together after we met at The Wolseley where we were both working in 1969. I had been in The Brumbeats and had continued with Bruce Gibbins (bass player) after their demise as a sort of 'Simon and Garfunkel' vocal guitar duo. After the Vikings, Terry and Cheryl had been in a band that also included Pete Oliver, the guitar salesman from Midlands Music, Wasp, and then Woodroffe's when they were in Dale End." Folk music featuring traditional and contemporary songs was enjoying a revival at this time. Birmingham's own influential Ian Campbell Folk Group were well-known from the early 1960s. Bob Dylan had brought the style into the mainstream along with Simon and Garfunkel, but this type of live music was particularly welcoming to female singers. This was demonstrated by the international popularity of line-ups such as "The Springfields" (of Dusty fame), "Peter, Paul and Mary", and of course Australia's famous "Seekers" who went on to inspire many others of which The Settlers who gained a Decca recording contract were likely the most successful locally. Robbie Harper said; "Me and Terry and Cheryl met for a rehearsal. We tried a few Springfields and Peter, Paul and Mary songs and it just seemed to click into place. I played guitar, Terry on bass and Cheryl played tambourine. Her fabulous voice together with our backing vocals were very soon popular throughout the Midlands and beyond. We were lucky because we were seen by Don McClean, the midlands comic. He recommended us to a couple of agents and we were away!" Cheryl Wallace recalled; "When we all first got together, it was astonishing how we gelled so rapidly vocally, after just a few rehearsals together and our sound as a band/trio was quite a surprise to us all. I was a very shy lady from the outset but with Rob's wonderful musical arrangements and Terry's encouragement we seemed to go from strength to strength. The later 1960s and into the 70s saw a general decline in live music venues as record-spinning disk jockeys (DJs) and disco's gradually took over. However, the "working mens" and "social" clubs remained a stronghold for quality live entertainment for which folk music with its relatively low volume was especially suited. Robbie; "The workingmen's club scene was massive in the 70s and we played most of them in the Midlands. We supported many TV stars and also were top of the bill when we worked in rural places." Cheryl; "It was not just strictly folk music we did. We would include other artists like The Everley Brothers, Roy Orbison and many others to give people a variety of music. People loved The Seekers songs we did and Peter Paul & Mary songs as it instantly gave them a connection to songs they loved and could sing along to." Terry Wallace recalled; "I have to say that it was the most enjoyable time I ever had in the music business. We were doing folk clubs where the crowd hung on your every word. We'd do top class variety shows with wonderfully talented artistes like that great Brummie comedian Bob Hatch." Many of the Southeners performances were in the Black Country where they found the positive audience response to be overwhelming. They played alongside some well-known names including "Freddie Starr" at a show in Wolverhampton and a show with the "Barron Nights" in Lichfield. Robbie said; "Terry was so solid on bass and we provided the harmonies for Cheryl who is probably the most underrated singer ever to come out of Brum. She looked a stunner but more importantly she had a fantastic voice. They tried to tempt her away to join Pickettywitch but she stayed with us." Cheryl; "Rob and I could harmonise to just about anything! Even though I did sing lead in some of the numbers that we did, for me, hearing our harmonies in the chorus of each song or all the way through a song, as I stood between Rob and Terry used to fill me with awe because I loved the magic human voices could produce in harmony and I still do." While still working steady day jobs at Metro-Cammel and Leyland in Washwood Heath, demands of a growing family and the security of a regular income inevitably placed increasing pressure on the trio. Robbie; "We had about six very happy years together and only called it a day when Cheryl had her second baby girl as, in those days, it was impossible to continue. We reformed for a few months in the early 80s but we both had young families so it didn't last." Terry Wallace continued to play guitar part-time in a number of local bands. He played bass with "Hawaian Sound" and "Midnight Shift". He also sang with "Snap Crackle and Pop" with Brian Betteridge (of El Riot and The Rebels and The Vogues) on guitar. In recent years, Terry Wallace became ill and it was sadly discovered he had cancer. His last performance came at his own benefit gig in Witton's Barn Social Club in 2007. The gig included performances by other top names from the Birmingham music scene of the 1960s, including Danny King, and former band mates Mike Sheridan and Ace Kefford. Terry passed away on August 14, 2008. Robbie; "We last sang at Terry's benefit concerts when he knew he had a terminal illness. We also performed in Tamworth and at a local hospital. Even though the occasions were sad, it lifted Terry's spirit like nothing else could." Cheryl; "I had absolutely no idea of how much Terry my husband enjoyed being a part of The Southerners at all! I suppose with him being a professional musician from the time we met and The Vikings long success, it never occurred to me what pleasure our trio actually gave him given that he had played with other bands too, so indeed it was quite a revelation to me. When I read his comments about his time with The Southeners in Laurie Hornsby's book Brum Rocked On!, it really touched my heart!"